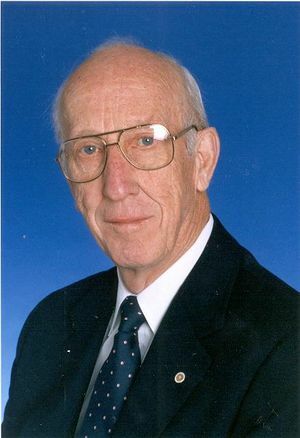 Robert M. Saunders, IEEE President, 1977, researched the development and application of electromechanical devices. Robert Mallough Saunders was born in Canada but was raised and educated in Minnesota, where he received the BSEE and MS from the University of Minnesota. Soon after his release from active Naval duty in World War II, he joined the University of California. He spent 18 years on the Berkeley campus, including four years as Chairman of the Department of Electrical Engineering. In 1964 he moved to a new campus of the University of California at Irvine to organize the School of Engineering there. He served as Dean of Engineering until 1973 and since then has continued as Professor of Electrical Engineering, observing his 40th year with the University of California in 1986 and his 50th year of teaching in 1988. His research interests have involved the development of the theory and applications of electromechanical devices with emphasis on rotating electrical machines, system theory, and the use of digital computers for modeling of electromechanical devices in systems. Professor Saunders spent 1954-55 at MIT, working with a faculty group in revolutionizing the teaching of electromechanics, influencing a major change in the teaching of the subject. He was the Simon Fellow at the University of Manchester, England, in 1960. In 1971 he was awarded the degree Doctor of Engineering from the Tokyo Institute of Technology. He is a Fellow of the American Association for Advancement of Science (1985) and also of the Accreditation Board for Engineering and Technology (1988). He served a three-year term on the National Science Foundation Advisory Committee for Engineering (1968-71), having previously served on NSF committees in 1962 for a Conference on Research in Control Systems and a Workshop on Systems Engineering. He was a member of the Board of Visitors for the U.S. Army Transportation School (1969-73) and a member of the Secretary of the Navy's Advisory Board on Education and Training for an unprecedented eight-year term. As a member of the American Society for Engineering Education he served as Secretary, Vice-Chairman and Chairman of the Electrical Division (1963-66). Dr. Saunders' activities in the IEEE have been a major focus of his professional energies, beginning as an officer of the University of Minnesota Branch of the AIEE while an undergraduate, as Counselor for the joint AIEE-IRE Branch at UC Berkeley, as Secretary and Chairman of the AIEE District 8 Student Activities Committee (1948-51), and moving on to local, national and international levels. He was a long-time member of the Rotating Machinery Committee of the AIEE and the IEEE Power Engineering Society. He organized the Theory Subcommittee of that Committee and served as Chairman for several years. In 1973 he was appointed to the IEEE Board of Directors and served as a Director unti11980. In 1976 he was appointed Vice-President for Regional Affairs and in 1977 was elected President of the IEEE. 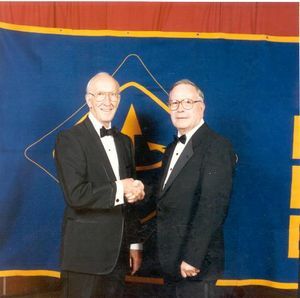 For the American Association of Engineering Societies Dr. Saunders served as a member of the Organizing Committee (1977-80), as a member of the Executive Committee (1982-84), and as Chairman of the Board of Governors (1983). This page was last edited on 25 February 2016, at 16:45.